The original 1957 twelve-track New Tricks LP has been freshly mastered from the original session tapes and expanded with twelve bonus tracks, including nine that have never previously been released. 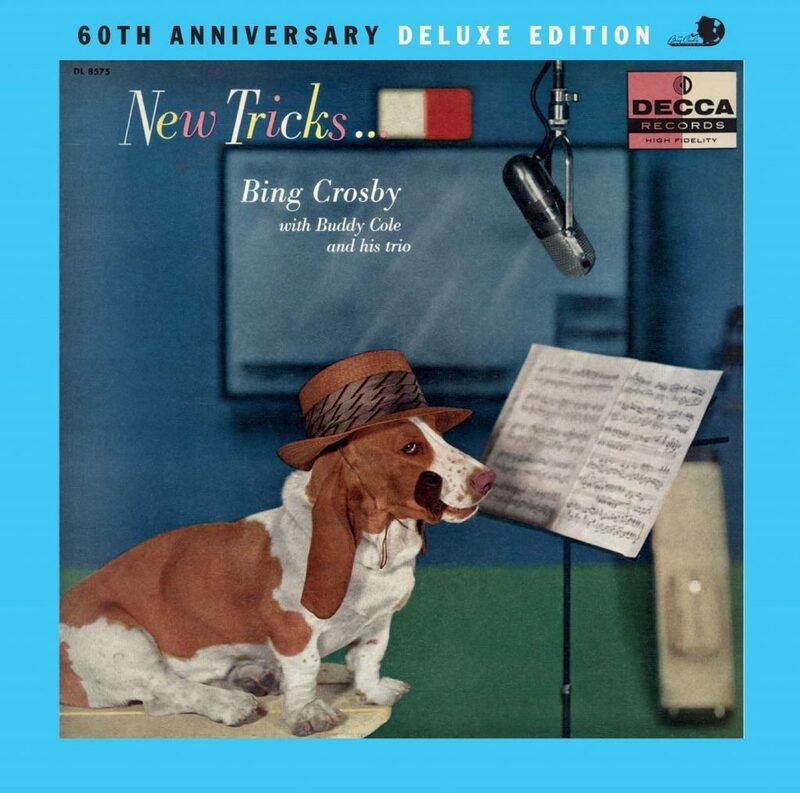 Bing is accompanied by Buddy Cole and His Trio, and the small group setting is a wonderful showcase for his voice on such standards as “Georgia on My Mind,” “Between the Devil and the Deep Blue Sea,” and “Chicago.” New Tricks is the fourth and final 1950s Decca Crosby LP to be reissued in the deluxe format by the Bing Crosby Archive. In 2013 Bing’s first LP, Le Bing: Song Hits of Paris (1953), received the deluxe treatment. Some Fine Old Chestnuts (1954) and Songs I Wish I’d Sung the First Time Around (1956) were released in deluxe editions in 2014. Among My Souvenirs: More Treasures from the Crosby Archive is a 2-CD collection of 35 previously unissued recordings spanning Bing Crosby’s entire career. The set, newly compiled by Crosby archivist Robert S. Bader, is comprised of recordings made between 1932 and 1977, and includes outtakes, live recordings, and radio and television performances, many featuring songs not previously part of the voluminous Crosby discography. Among the rarities: a 1968 recording with Diana Ross and the Supremes; some recently discovered concert recordings from 1956, and a track from Bing’s final American concert in 1977. Among My Souvenirs is a companion volume to the 2010 Bing Crosby Archive release, So Rare: Treasures from the Crosby Archive. 13. What Do You Do in the Infantry?